About the Author: Shweta Luthra is visionary designer who comes with over a decade of industry experience under her belt, having done her Masters in Housing from the reputed School of Planning & Architecture back in the year 2002. Not just reading books and articles, she travels around the world in order to stay in line with international trends and practices. She understands that first and foremost, detailed client interaction is a priority so that hi-end designs can take shape with precision and accuracy. Under the tutelage of Marc, a highly successful interior design personnel from London, Shweta was introduced to a new dimension of Creating Energy Spaces a few years ago. Home is an extension of ourselves; ergo, by enhancing its energy in multiple shapes and forms, we can transform our inner capabilities slowly but surely. Since childhood, multiple times I have heard that we are energy, everything around us is energy. Even all spiritual practitioners & healers talk about energy. I do believe in it but honestly have never given a deeper thought to it. Luckily, last year in 2017, I got introduced to the concept of energy spaces by my coach, Marc an eminent interior designer from London. He is a ‘Shaman’ who is actively practicing & teaching about ‘Sacred Spaces’ & how they can transform our lives. What I learnt from here is the fact that everything on this earth including us is a form of energy. We can raise the energy of our home spaces where we spend most of our time, which will enhance our energy & capabilities too. I learnt about ‘power spots’ which are the crossing points where earth’s electromagnetic lines from North pole & South pole meet. These are the points of very high-energy frequency & most of our ancient sacred temples/cathedrals were built on it. The purpose was that people who visited these temples found that their energy capabilities were raised & inner transformation happened for them. Few examples to quote are the oldest recorded temple of Tiwanaku, Stonehenge in Britain and Pyramids of Giza. learning reminded me of ‘Dhyanlinga’ built by Sadhguru of Isha Foundation with a deeper knowledge & mastery over the inner energies. I happen to visit ‘Dhyanlinga’ few years back when I joined ‘Isha Foundation’. Sadhguru refers to these temples as consecrated spaces & public charging sites. So, the question is how these high energy, sacred plates are related to our homes. transformation will happen which will bring lasting changes for us. About the author Shweta Luthra: A brainchild of Shweta Luthra, Bella Casa is a byproduct of our do-it-all visionary designer who comes with over a decade of industry experience under her belt, having done her Masters in Housing from the reputed School of Planning & Architecture back in the year 2002. Not just reading books and articles, she travels around the world in order to stay in line with international trends and practices. She understands that first and foremost, detailed client interaction is a priority so that hi-end designs can take shape with precision and accuracy. This year, April 2018, I got lucky to be there with my Mentor, Marc, an Eminent Interior Designer from London. Sharing a few excerpts from experience I had while exploring beautiful designs of my favorite designers. Headed by the creative director Tomas Maier, Bottega Veneta’s ground floor boutique in Milan is located in high ceilinged, beautifully be frescoed 18th century Palazzo Gallarati Scotti. This year they launched its first modular seating system Bottega Veneta Tre. It’s modern in design & function, has a corner section, single seat section & pouf configured to suit one’s need, but it is also modern in design, applying the house’s instantly recognizable interlocking intrecciato design to the sides of its sleek,squared-off, Space Age sections. A particular highlight of the new collection is in the lighting category: three bronze styles created in collaboration with Osanna Visconti di Modrone. They are made with a lost-wax technique to echo the intrecciato weave. This marks the second collaboration between Maier & Visconti di Modrone, following the set of Bronze tables presented in 2016. The presentation featured new styles, functions, materials, and colors for both furniture and home accessories. The seating collection has been expanded with both new families and variations of existing ones, featuring unusual details, as well as new colors and materials. Louis Vuitton showcased its objets Nomades collection at Palazzo Bocconi in Milan, last April 2018. Hop over to original blog post by Shweta Luthra to checkout few collections showcased by some of the world’s most renowned designers like Humberto & Fernando, Campana, Marcel Wanders, Atelier Oi, Patricia Urquiola and Andre fu. Shweta’s latest passion is “Sacred Energy Spaces”. Under the tutelage of Marc, a highly successful interior designer from London, Shweta was introduced to a new dimension of Creating Energy Spaces a few years ago. Home is an extension of ourselves; ergo, by enhancing its energy in multiple shapes and forms, we can transform our inner capabilities slowly but surely. She can be reached at shweta@bellacasaindia.com. A well-funded venture in Mumbai region is looking for a world-class CTO to lead and enhance the technology infrastructure for a successful online product (portal) with a successful brick-and-mortar business model. Email your profile to careers@bizvidya.com for a completely confidential discussion. 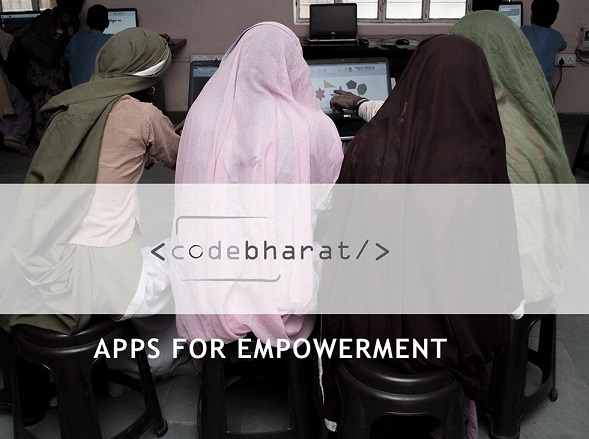 Digital Empowerment Foundation (DEF), under its CodeBharat program, is inviting applications from individual App developers who are passionate about working on real-world bottom-of-pyramid problems and implementing cutting-edge solutions. This is an exciting opportunity for developers to conceptualize, visualize, design and develop solutions that improve the quality of life for underprivileged communities in rural areas. Through this program, DEF aims to nurture innovators who are inspired to solve social problems and are passionately self-driven to lead a project from ideation and conceptualization to design and development, taking responsibility for end-to-end execution of ideas. This program shall provide the necessary resources and infrastructure to help app developers translate their skills and passion into real-world working solutions for social development and impact purposes. DEF shall engage and nurture app developers in different solution categories based on their interests, skills and strengths. Apps for Education: There are about 1.4 million schools in India employing about 7 million teachers. Areas of designing mobile solutions could be around improving access to education and enhancing quality of education; increasing attendance at schools; ensuring availability of infrastructure, 100% delivery of education; etc. Apps for Panchayats: With 265,000 Panchayats in the country and 3 million Panchayat elected members across India, we need tools for Panchayats to manage their resources; engage their communities; achieve better governance; provide services to citizens; etc. Tools & Utility Apps: Apps that can ease the process of benchmarking, community mapping, data management, surveys and research. This may also include solutions in areas like identity verification, Aadhar, BPL cards, Ration Cards, Voter Cards, government entitlements and others. Infrastructure Apps: Apps that help manage large-scale project implementations, monitor government schemes and track local issues, campaigns and elections. Also, tools related to banking, microfinance and complaint mechanisms for local issues like water, transport, crime, etc. Health Apps: Considering there are about 2 million frontline health workers in India, the entire ecosystems around them needs information dissemination, training and capacity building, monitoring and evaluation, and engage with communities to deliver better health services. Tenure of CodeBharat Program: 6 – 12 months based on needs of the specific project and availability of the candidate. Benefits to Developers: A monthly remuneration, incubation support including infrastructure and mentoring support. Developers who complete the full tenure of the program, shall have the opportunity to be co-founders of any entity that may be founded as a result of a successful implementation. Eligibility Criteria: The applicant should herself / himself be the programmer, coder, visualizer & have very strong sense of understanding of the concerned subjects. How to Apply: Email your CV with portfolio links to amar@defindia.org mentioning your name, current location and years of experience in app development in SUBJECT of the email with a short note as to why CodeBharat interests you and how you can contribute. Thanks to all the amazing entrepreneurs who made sure the event was a rocking success! …and rich sharing of business referrals & leads! Next meetup is on June 21, 2014 (3rd Saturday of each month)! 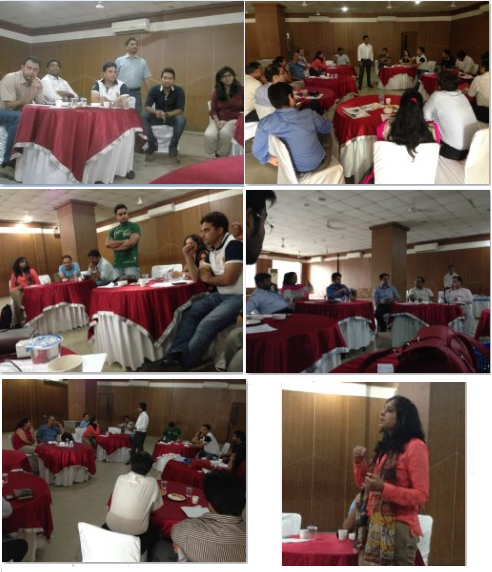 Interesting new groups keep popping up in Delhi – the freshest is Peerstrat initiated by Omnizient Labs. This group is designed for entrepreneurs and SMEs. 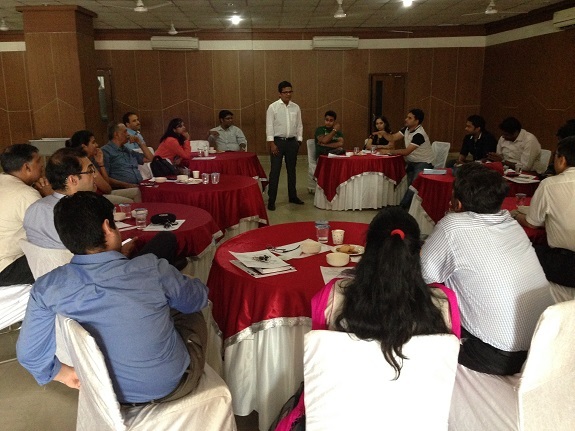 Participants review each other’s businesses and explore ways to grow faster and be the best in your industry. Lively insightful interaction! To know more about the structure of PEERSTRAT see this presentation here. We are getting a huge response on our Facebook post here. Bookmark http://facebook.com/peerstrat to stay tuned for more news and events.